Searching for the Fourth Dimension, by Salvador Dali, explores humanity’s quest for an additional dimension to our Universe. 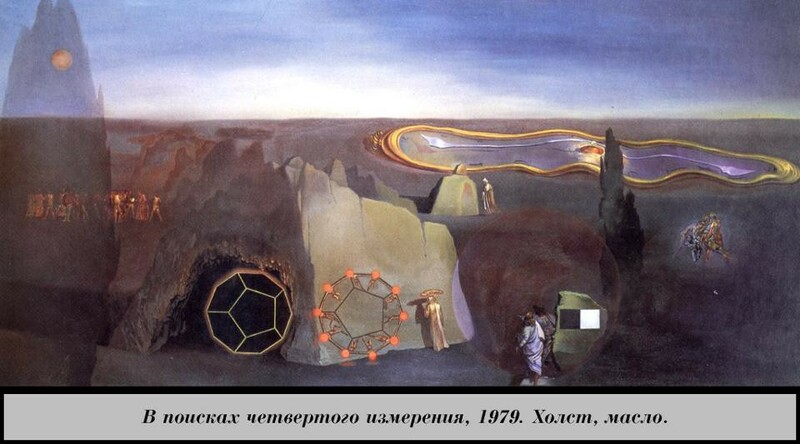 Image credit: S. Dali, 1979. If it weren’t just the three space and one time dimensions, what would be different? or you could simply remove someone from the 3D Universe they’re inhabiting, plunking them down at some later time in any location (or not) at your whimsy. How is this possible? It’s the same idea as if you — a 3D creature — were interacting with a 2D Universe. Mickey Mouse Fun House Colorforms, an example of a 2D universe. As 3D creatures, we can alter their reality at will. Image credit: Jim, the Photographer / flickr. You would be as godlike as a child would be to a Universe full of colorforms or stickers on a sheet of paper. From the perspective of our extra (third) spatial dimension, we could reach inside any 2D creature and move their insides around without ever cutting them. We could flip them inside out, or reverse their left-and-right. We could pick them “up” off their Universe and plunk them down anyplace else. then shrinking, growing and disappearing at our necks and heads. The brain and head of an adult male human, as shown in slices from a CT scan. Slices are all you could ever perceive in a 2D universe. Image credit: Dale Mahalko of Wikimedia Commons. Thankfully, there are no 4D creatures inhabiting our Universe, as they would appear indistinguishable from physics-defying, godlike entities. But what if instead of us being higher-dimensional creatures in our Universe, the Universe itself had more dimensions that it has right now? I would like to point out that this is something that’s possible; it has been shown that the Universe could have had more dimensions in the past. The first paper to ever show that an additional dimension could have existed in the early Universe and be imperceptible today was by Chodos and Detweiler in 1980. Image credit: Chodos and Detweiler, Phys. Rev. D., 21, 8 (1980). It is relatively straightforward, in the context of general relativity, to construct spacetimes where the number of “large” (i.e., macroscopic) dimensions changes with time. Not only could you have had a large extra dimension in the past, you can have one in the future, or you could even construct a spacetime where that number oscillates, or gets larger-and-smaller-and-larger again over time. The physical implications are awesome: we can have a Universe where a fourth — or extra — spatial dimension begins to appear. The four-dimensional analogue of a 3D cube is an 8-cell (left); the 24-cell (right) has no 3D analogue. Extra dimensions bring with them extra possibilities. Image credit: Jason Hise with Maya and Macromedia Fireworks. What would that be like? We don’t normally think about it, but the four fundamental force — gravity, electromagnetism, and the two nuclear forces — only have the properties and strengths that they do because they exist in the number of dimensions our Universe has. If we reduced or increased the number of dimensions, we’d change the way that, for example, field lines of force spread out. This would be catastrophic if electromagnetism or the nuclear forces were affected immediately, as atoms or atomic nuclei could become unbound, change drastically in size, or otherwise create an absolute mess for any bound structure (like humans) that depend on them. The strength of forces, like the electromagnetic force, is incredibly important for chemical and biological systems, not to mention very sensitive physical systems. Slight changes can have huge consequences, and a fourth dimension would lead to no small change. Image credit: Paul Falstad’s 3-D Vector Fields Applet. Here’s how that would work. Consider an atom, where electrons orbit a charged nucleus, or the inside of an atom at the atomic nucleus itself. Nuclei and the atoms formed from them are the building blocks of all the matter that makes our world up, and they’re on extremely small scales: Ångströms for atoms (10^-10 meters), femtometers (10^-15 meters) for nuclei. If you allowed those forces to “bleed” into another spatial dimension, which they could do once that dimension reached a large enough size, the force laws governing them would change. In general, those forces have more “space” to spread out into, meaning they get weaker with distance faster if there are more dimensions. For nuclei, the change might not be so bad: the sizes of nuclei would be slightly bigger, and some nuclei might change in their stability, either becoming radioactive or by having radioactive ones becoming stable. That part’s not so bad. But electromagnetism would be very problematic. The atomic orbitals in their ground state (top left), along with the next-lowest energy states as you progress rightwards and then down. These fundamental configurations govern how atoms behave and exert inter-atomic forces. Image credit: Wikipedia page on Atomic Orbitals. Imagine what would happen if all-of-a-sudden, the forces binding electrons to nuclei became weaker. If there was a change in how strong that interaction was. You don’t think about it, but at a molecular level, the only thing holding you together is the relatively weak bonds between electrons and nuclei. If you change that force, you change the configurations of everything. Enzymes would denature; proteins would change shape; ligand-gated neurons wouldn’t fit together anymore; DNA wouldn’t encode the molecules it was designed to encode. In other words, if the electromagnetic force changed because that force made its way into a large, fourth spatial dimension that reached the scale of Ångströms or so, human beings would immediately have their bodies shut down and die. Ligand-gated Q-cells are essential channels with multiple biological applications, and are particularly needed for the human body to function. With a large fourth dimension, these cells would cease to function. Image credit: Biolin Scientific. But not all hope is lost! There are plenty of models out there — mostly inspired by string theory — where those forces, the electromagnetic and nuclear ones, are confined to three dimensions. Only gravity, then, would be able to navigate through the fourth dimension. What this would mean for us, as the fourth dimension emerged and grew in size (and hence, in its effects), is that gravity would begin “bleeding” into that extra dimension. And hence, objects would experience less attraction than we’re used to. This would begin to result in a number of “weird” behaviors. A computer-generated rendering of a rubble-pile asteroid and a debris field of surrounding rubble. Based on a 3-D model of asteroid Itokawa by Doug Ellison, and with data from NASA-JPL. Image credit: Kevin Gill / flickr. Asteroids, at first — the ones loosely held together that spun rapidly — would come apart, as their gravity would be insufficient to hold those rocks and grains onto their surfaces. Comets, when they came close to the Sun, would evaporate more quickly and develop more spectacular tails. And if the fourth dimension grew large enough, the gravitational forces on Earth would drop tremendously, causing our planet to grow larger, particularly along the equator. People living near the poles would feel like they were in a reduced gravity environment, but people living on the equator would be in danger of being flung into space. On a macro level, Newton’s famous gravitational law — the inverse square law — would suddenly become an inverse cube law, falling off much faster with distance. If the dimension grew as large as the Earth-Sun distance, in fact, everything in our Solar System would become unbound. If this lasted for more than a few days out of the year — even if gravity went back to normal for the other 50 weeks or so — our Solar System would dissociate completely in only a century. If a fourth dimension were large enough, the solar system would dissociate as the gravitational force law changed to make elliptical orbits around the Sun fundamentally unstable. Image credit: Johns Hopkins University Applied Physics Laboratory/Southwest Research Institute (JHUAPL/SwRI). We would have periods on Earth where we’d not only perceive an “extra” way to move through space, where there was a fourth “direction” in addition to up-and-down, left-and-right, and forward-and-back, but where the properties of gravitation would change tremendously and not for the better. While high-jump and long-jump competitions would never be the same, the consequences for the stable Universe we hold so dear would be apocalyptic. An extra dimension, so long as it remained on a small enough scale, would barely be noticeable, particularly if electromagnetism remained confined to our three dimensions. But allow that fourth spatial dimension to grow large enough that you could actually move through it? The planet itself — and possibly even the stars, galaxies and the entire Universe — would be endangered. For that very brief time that we got to experience it, it would be unlike anything else the Universe had seen before. But almost immediately, the Universe would see everything in it destroyed. Be careful what you wish for.